Even though this comfort food classic is extremely quick and easy to make doesn’t mean it’s not extraordinary because it really is!!! Packed with powerful, dreamy flavors and lots of veggies. For the sauce, I used a jar of light Alfredo sauce. Each huge portion has 323 calories, 9 grams of fat and 8 Weight Watchers POINTS PLUS. It’s one of my favorites and my husband’s too. I hope you enjoy it! 1. Cook the spaghetti according to package directions, except omit the cooking oil and salt. Cook al dente, about 5 minutes. Drain well and rinse in cold water. Set aside. 2. Meanwhile, in a microwave safe bowl, add the zucchini, onions and red bell pepper. Cook for about 4-5 minutes, until onions are soft. 3. 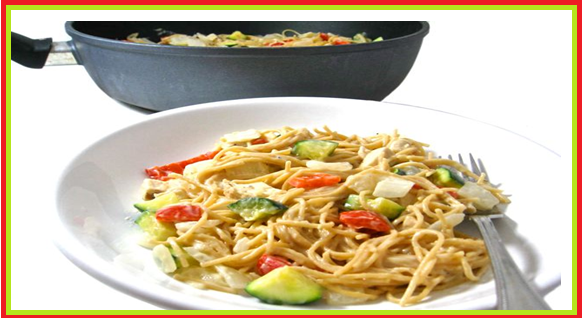 In a large nonstick pan, add cooked vegetables, Alfredo sauce, chicken, pasta, Parmesan cheese, milk and season with a little black pepper. Mix together well over med-high heat. Turn heat down and simmer, stirring often for about 5-8 minutes, until heated through. 4. Serve immediately. Store any leftovers in refrigerator. You might need to add a little more nonfat milk to thin before reheating in microwave. This recipe freezes great too. Tetrazzini is an American dish often made with diced chicken, turkey, tuna or seafood with vegetables such as mushrooms and onions and cooked in a butter/cream sauce. Usually served over pasta There are numerous variations of this dish. Chicken tetrazzini was made famous by chef Louis Paquet. 323 calories, 9g fat, 22g protein, 40g carbs, 6g fiber, 658mg sodium, 4g sugar.